SEOUL, Nov. 29 (Yonhap) -- The decadeslong alliance between South Korea and the United States will remain intact and get stronger even after President-elect Donald Trump takes office next year, the U.S. ambassador to South Korea said Tuesday. 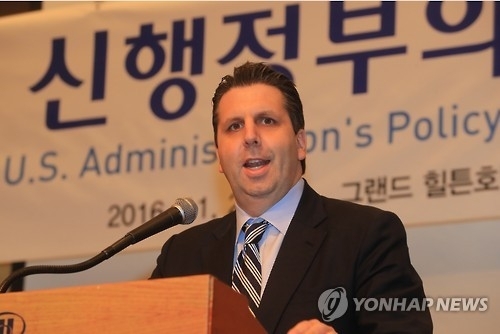 As Seoul and Washington have built up strong ties in the past 60-plus years, their bilateral alliance will remain firm and get stronger after the Trump administration's inaguration on Jan. 20, Mark Lippert said in a forum in Seoul. The alliance will remain intact based on the two countries' bilateral ties in security, economics and person-to-person relationship, the top envoy added. But he remained cautious, saying it is "too early to answer" questions about the Trump government's policy toward East Asia, and North Korea's nuclear and missile development programs. He made the remarks during a congratulatory speech for the forum titled, "The New U.S. Administration's Policy toward East Asia & North Korean Nuclear Programs," organized by the Research Institute for National Security Affairs of Korea National Defense University. During the presidential race, Trump argued that the U.S. should no longer be the "policeman of the world," expressing deeply negative views toward U.S. security commitments overseas and claiming it makes no sense for the U.S. to help defend such wealthy allies as Japan, South Korea and Saudi Arabia in exchange for little. He has said allies should pay 100 percent of the cost of stationing American troops or the U.S. should be prepared to end their protection. He even suggested allowing South Korea and Japan to develop their own nuclear weapons for self-defense so as to reduce U.S. security burdens. Some 28,500 American troops are stationed in South Korea to deter North Korean aggression, a legacy of the 1950-53 Korean War, which ended in a truce, not a peace treaty. Many international affairs experts have said the U.S. troop presence is in line with U.S. interests as the region has to face China's steady rise.